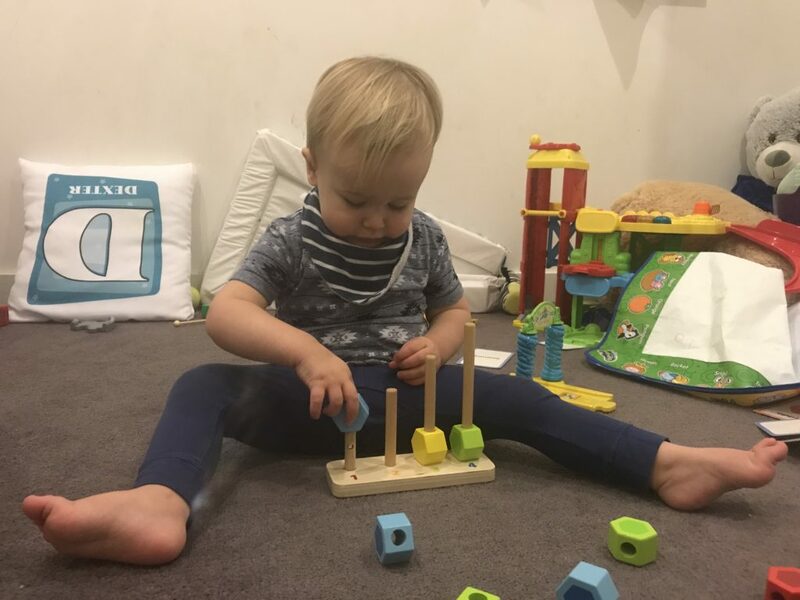 Welcome to Dexter’s 20 month old milestones update. It’s been a funny old month; usually January seems to drag on and on, but this year it’s flown by so quickly I can hardly catch my breath. This is what is new with Dexter this month. We have new teeth! Two canines which have erupted and grown to be the same size as the other teeth in a matter of a couple of weeks. Meanwhile the lower canines have broken through the gums slightly but are refusing to push their way into the world. We’ve had lots of cries for the dummy, hands in mouth and chewing on anything and everything over the past few weeks! Since he was born, Dexter has only ever drank milk and water, that was until Christmas Day when his Grandma offered him a taste of her Schloer. He gulped it down enthusiastically, stopped for a second and then spat out into his bib the remains whilst pulling the most disgusted face. Absolutely hilarious, but I think we’ll stick to milk and water for now. He takes a cup of water to bed with him every night and has it throughout the day while he is at the childminders. On our days off he will drink a cup and a half of milk. he is still using a 360 cup. We have tried offering him an open cup but each time it results in him spilling the contents everywhere and at the moment he refuses to be shown how it works. He occasionally drinks water out of a plastic bottle as well which he finds hilarious. He also loves trying to screw the lid back on, taking it off again, pretending to drink and then repeating the whole process. Super cute! Talking of Christmas, this month saw Dexter celebrating his second Christmas with us. Lots of people asked me if he knew what was going on and the answer is no, he didn’t have a bloomin’ clue! We tried to encourage him to open presents but he was happier wandering off. I am so excited for next year when I hope he will finally get it! We’ve had lots of new words this month which has been amazing for communication. After eating he will ask us for a ‘ba‘ and go running to the bathroom, trying to climb into the tub (and let me tell you, he’s not far off being able to get in!) He can now say ‘Daddy’ and when Daddy decides to go and sit in the bathroom on his phone for half an hour, Dex will wander round asking ‘Daddy? Daddy?‘ I also taught him to shout Daddy when we see him waiting for us in the car park at the end of the day. His other new word is ‘Sarah’ which is the name of his childminder. Unfortunately he doesn’t quite grasp that and insists on calling ME Sarah all day, everyday. He has started repeating most words I say to him, but can he repeat Mummy? No, he cannot. Gah. He has also started shouting ‘Cheeeeeese’ whenever I get my phone out to snap a photo. It’s incredible what they pick up isn’t it? He also says ‘Knock Knock’ whenever we are near a door (outdoors OR indoors) and raps on it with his knuckles. We have had some major temper tantrums this past month which results in Dexter throwing whatever he can get his hands on. We noticed as the month wore on that he was looking to us first and then throwing things whenever we had said no. It was as if he was testing us. I now understand why parents say that kids LOVE boundaries and routines. After noticing this, I made sure that I was always reinforcing that it is not acceptable to throw things. We’ve seen a decrease in the tantrums as the month as gone on, the increased communication has certainly helped (I’m finding it easier to understand when he want a snack or his dummy) but also the amount of empathy we show when he does feel frustrated. I have also tried to make the environment as safe as possible so I am not having to say no so often. I have cleared our hallway which used to have my dressing table in it, moved it to my bedroom and made that area a child free zone. Dex now has the whole hallway to play in (it’s a large long space) and I’m not forever having to tell him to stop messing with my make up. Talking of make up, Dexter loves copying Mummy and putting on his blush and mascara. He even likes pretending to put in contact lenses by putting his forefinger in the disposable lens case and putting his finger to his cheek, completely mimicking Mummy. This truly does surprise me because I usually have put them in before I fetch him from his cot in the morning so he must have seen me do this only a few times in his life. Before I moved the dressing table a couple of weeks ago, I turned my back for a few seconds and returned to find he had attempted to apply mascara to his lashes. Absolutely hilarious! This month we got him a stool from Ikea so he can get up to the sink to wash his hands and brush his teeth. He also uses it to get near light switches to turn them on and off and to get near the kitchen work tops so he can see me cooking and baking. 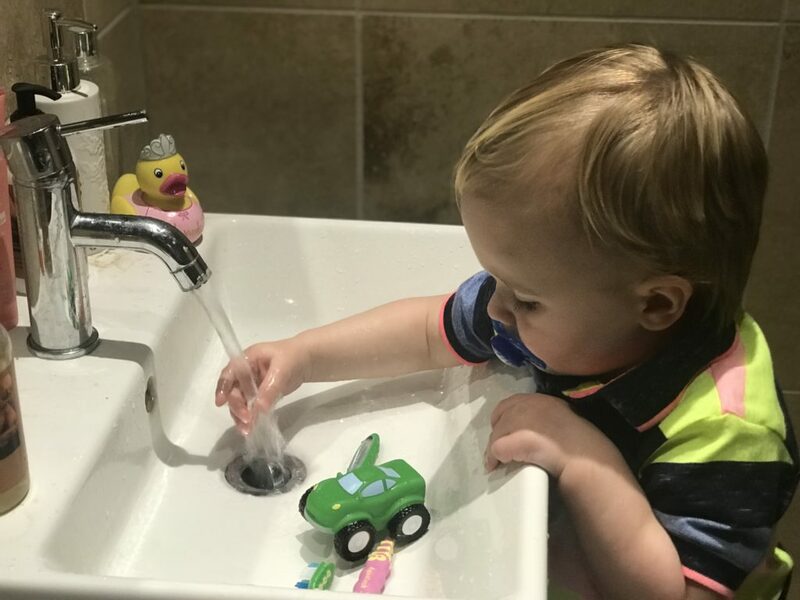 It’s been one of the greatest presents he has ever received and he could spend hours by the sink playing with the taps. I have slowly started putting away the 12-18 month clothes, especially vests and trousers. I bought a lot more 18-24 month tops, vests and leggings with Christmas money he received and I’ve loved seeing him in some new bits. Dexter has started sitting at the table with us to eat! 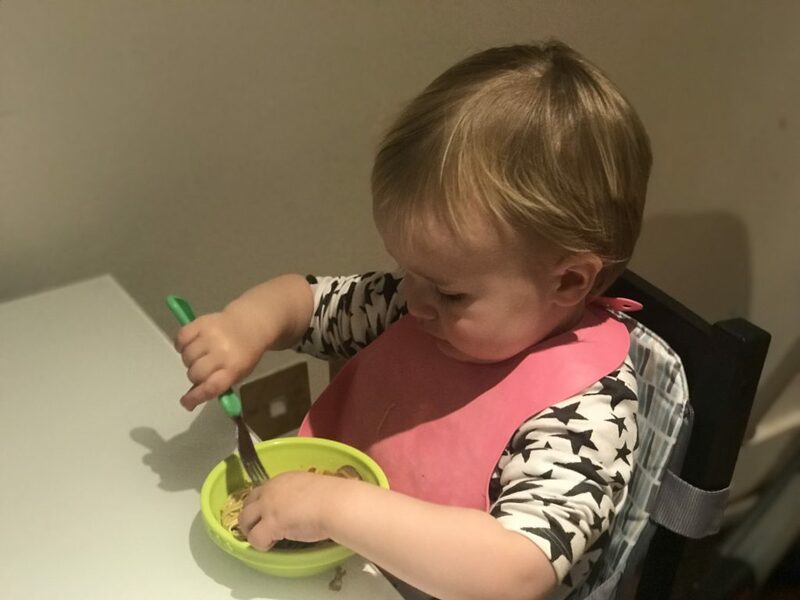 We were sent an amazing booster seat from Nuby last week which has meant he has been able to share our meal times. It’s been lovely to all sit together at the table using a bowl and a fork! Aww what a cutie pie! Freddie is waiting for his last molars to appear and they are causing him so much trouble!! Freddie tries to drink everyone else drinks all the time especially lemonade at mcdonalds belonging to James! Ahh those pesky molars. Hope they pop through soon. Oh my goodness, the fact that he copies putting contact lenses in, is just so adorable! He is such a cutie! I just hope he doesn’t start poking himself in the eye! Ah what a lovely post and lovely for you and Dex to look back on in years to come! I love remembering milestones – it can be easy to forget and i always have o write it down when one of my three does something new like cuts a tooth. It so important to have these cherished memories! I love having these updates to look back on! I hear you on the ‘mummy’ situation. Harrison will say dada, uncle, baby, all done – mummy? God know. It’s as though it is a swear word! He seems so old now, I can’t believe he is twenty months! I can’t quite believe it either! I hope one day both of our boys are shouting Mummy! The 360 is a life saver! I know! And here you are with another on the way. Time just flies by when you have the little ones in your life.